Our 4" x 6" Bunker Hill stick flags are made from a high quality, silk-like polyester fabric. They feature a hemmed flag mounted on a black plastic 10 inch staff with a gilded spear point. These versatile stick flags can be used on tabletops and desks, to wave in parades, or to decorate flower arrangements. Bases for the stick flags are sold separately and are available in our Accessories section. 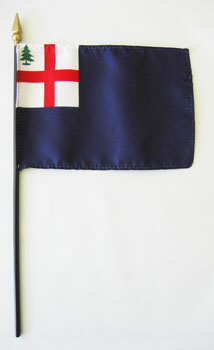 The flag is based on the red naval ensign of the Royal Navy, which featured the cross of St. George in the canton. The ensign was used at both the Jamestown and Plymouth colonies. Puritans in New England, led by Roger Williams, objected to the use of a Christian cross on their flag, and for a time flew a red flag with a plain white canton. The new flag first appeared in 1634 in Salem, but some considered it to be an act of rebellion against England.